Stick a fork in Whole Foods? Whole Foods may be toast. Granted, it's toast made from pricey, gluten-free, organic honey oat bread. But toast nonetheless. Shares of Whole Foods (WFM) plunged more than 10% Thursday after the high-end natural grocery chain reported sales and profits that missed analysts' forecasts. Its outlook did not impress investors either. Whole Foods has been cutting prices to try and counter its bad reputation for being too expensive. But doing that has hurt its profit margins. Making matters worse, many people STILL refer to the company as Whole Paycheck. It doesn't help that Whole Foods was found in late June to have been overcharging customers for some packaged, weighed goods in New York City. Co-CEOs Walter Robb and John Mackey have apologized for the mispricing and blamed it on human error. During the company's conference call with analysts Wednesday evening, Robb stressed that the company is doing what it can to ensure that this won't happen again. "Clear and transparent pricing is integral to how we operate," Robb said. "We have taken immediate steps to address these issues including improving our training regarding in-store packing, weighing and labeling processes and expanding our third-party auditing process company-wide." But Whole Foods is finding it difficult to overcome this bad publicity. Robb said that same-store sales, which is one of the most important measures of a retailer's health, fell during the week that New York City accused Whole Foods of price gouging. And sales have only recovered slowly since then. "The impact was really felt across the whole country, not [just] in New York City. This was national news," said Whole Foods CFO Glenda Flanagan. That's really a bad sign for the company. "The combination of falling margins and slowing sales growth presents a long term danger to profitability. The whole purpose of reducing prices should be to attract and keep more customers," said Stephen Ward, an analyst with retail research firm Conlumino, in a report Thursday. Disappointing Wall Street has become routine for Whole Foods lately. The stock fell more than 10% last year and is now down about 30% so far in 2015. And investors seem skeptical that the company's plans to create a new store concept -- 365 by Whole Foods Market -- will work. Whole Foods said earlier this year that it will open a handful of these new stores in 2016. They are likely to be aimed at younger consumers in urban areas, will be smaller than typical Whole Foods stores and offer cheaper products. Analysts grilled the company about the new stores during the call. One wondered if the 365 stores will eat into sales at existing Whole Foods locations. After all, the 365 stores are opening in many markets where Whole Foods already has a presence. Mackey admitted that this could be an issue. 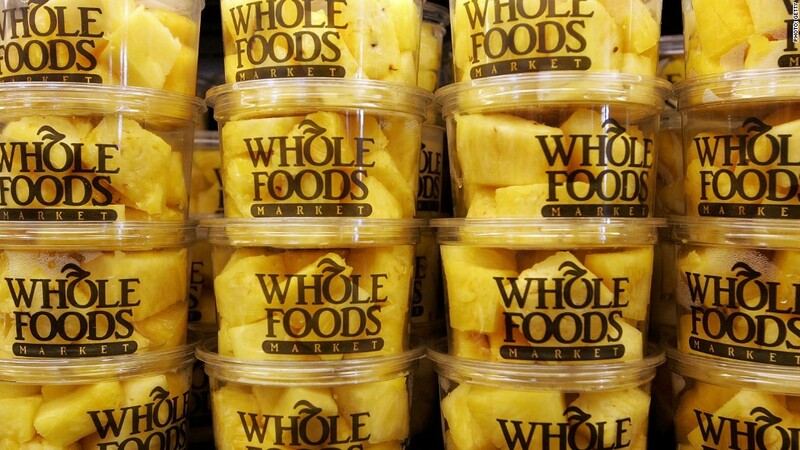 "Will there be some cannibalization of Whole Foods? I mean probably," he said. "But we don't know exactly how much until we do it. It'll probably be less than when we open up an actual branded Whole Foods Market store, because it's going to appeal to a little bit different customer, we think. So it is an experiment." That's a scary thing to hear from a CEO of a struggling company. If you're Facebook (FB), Netflix (NFLX) or Starbucks (SBUX), you can afford to experiment a bit. Because you can afford to fail. Whole Foods cannot. The biggest problem that Whole Foods faces is that organic is no longer niche. It's mainstream. Walmart (WMT), Costco (COST) and Kroger (KR) have recognized that and all now offer organic food for cheaper prices. So have privately held chains like Publix, Wegmans and Trader Joe's. Whole Foods is a victim of its own success. So now it's trying something else. And Mackey is not even sure how it will pan out. Another analyst asked him if the main goal of 365 was to attract new customers or "capture" more trips from existing shoppers. "It's both. It's both," Mackey said. "Although not to quibble with words, we never feel like we can capture any customers. At best, we can rent them for a little while if we continue to create value and service to them." Right now, it looks like Kroger and Costco are renting more of those customers.